Healthcare workers understand the complexity of fighting infections better than most. As medications are developed, germs evolve and become resistant to those medications. Over time, germs become incredibly complex and difficult to treat as they continue to evolve and adapt. Unfortunately, computer viruses seem to be following a similar pattern—and the healthcare industry is struggling to catch up. 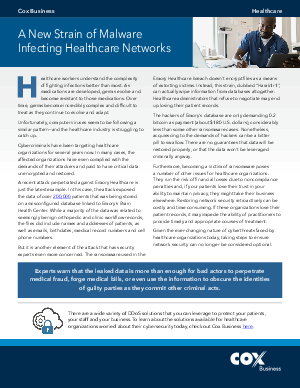 Download this white paper to discover a wide variety of DDoS solutions that you can leverage to protect your patients, your staff and your business.